This post might contain affiliate links (it might not, your guess is as good as mine). Let's just assume any links below are affiliates though, okay? 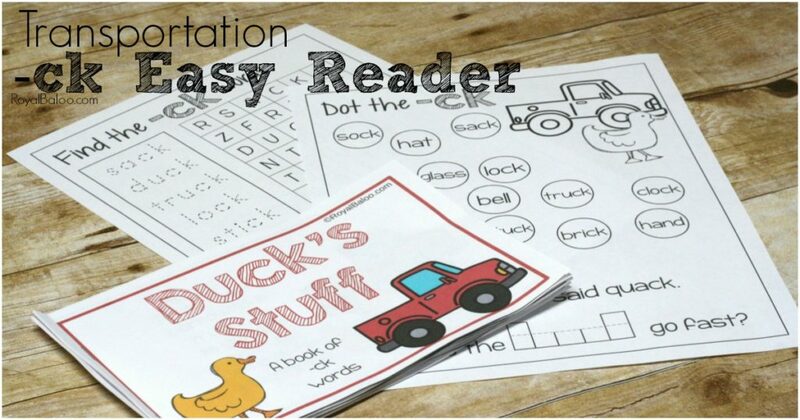 Getting kids excited about reading by themselves can be tricky. We spend years and years reading to them and they don’t want that to stop (and rightfully so) but sometimes that also means they resist reading by themselves. My kids are not really motivated readers. They take some prodding. But with easy reader books that they can really own, it’s a bit different. Even Logi-Bear, who isn’t quite a reader, gets really into the idea of having a book just for him. Plus, he can read a few of the words which gets him so excited. 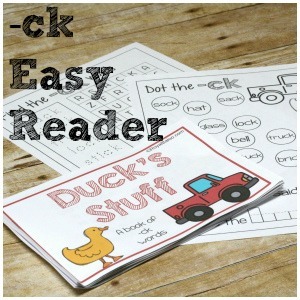 So I’ve been making easy reader books to spark that interest like this ck easy reader book all about duck and the truck. 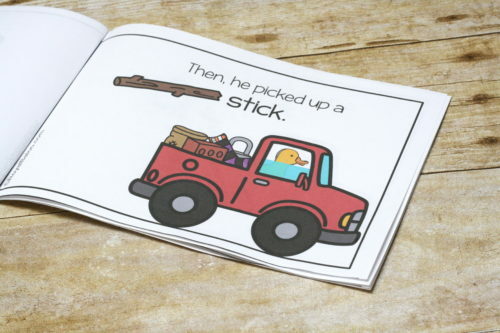 Long story short – duck borrows a truck and goes around picking up his belongings…that all happen to end with -ck. We are not done with transportation week yet! 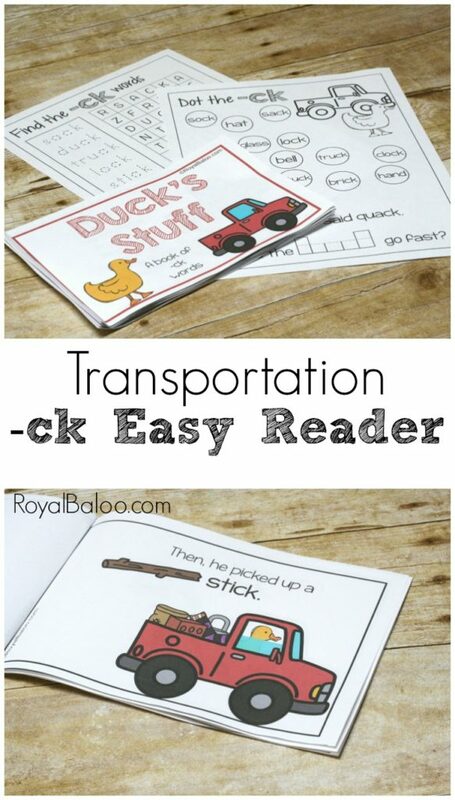 Be sure to sign up for the newsletter to get a handy little e-mail with links to ALL of the transportation printables! Or just keep an eye on the 31 Days of Printables page! I’m still trying to find a consistent way to position the pages for easiest printing, cutting, and stapling. For this one, you just have to cut and then put the pages in the right order. It’s not hard, but they’re top, bottom, top, bottom. I just put them on regular paper because I know they will get torn up eventually regardless of what paper I use. Royal had no trouble with the -ck reader but reading all those -ck words was good practice. Logi-Bear is not ready for a lot of these words though. So I read the top line and we work together on the bottom line. To be honest, this book is way far ahead of where he is. I thought it would be fun and he will definitely use it more seriously in the future. For now, it was a fun exercise. 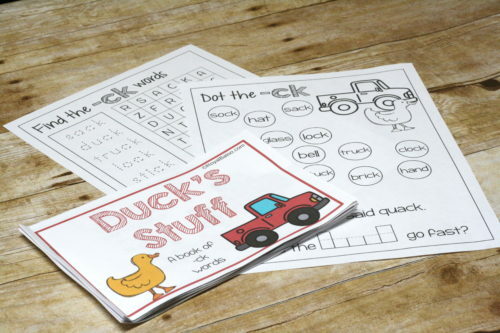 I made two activity sheets to go with this one (similar to the -oo Vowel Team book at Halloween!). The pages are really simply and my boys love them. The first page has a simple crossword with some of the -ck words. The puzzle itself is so small that five words is about all I can find! On the bottom is some space for writing sentences. 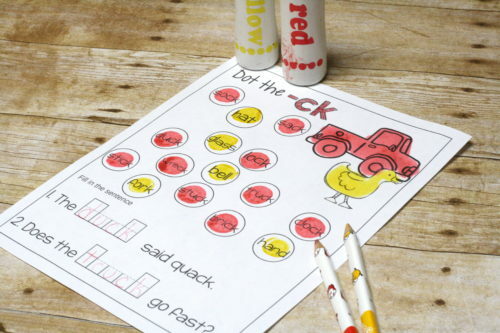 This is a dot marker page, although stickers or stamps will work fine too. 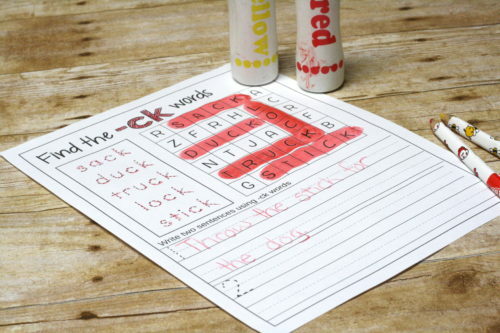 Dot all the -ck words one color and the rest another color! At the bottom there are two sentences with space to fill in the missing -ck words. Nice and simple! 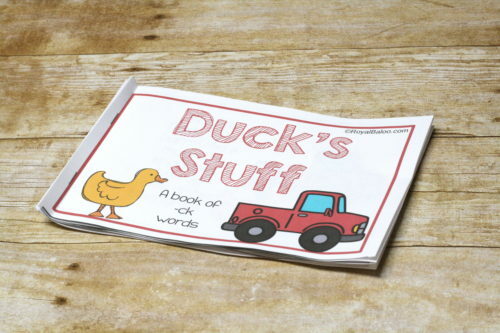 Go Here to Download the -ck Duck & Truck Easy Reader Book! Subscribe to the newsletter to receive weekly e-mails! No spam, just fun.